Adjacent to the hotel complex is an attractive multi-purpose sports hall Arena Samokov, suitable for many sports. In summer you can enjoy a cool and peaceful holiday, but during the winter months to feel the mild winter and take advantage of the facilities located within 10 minutes - Borovets. 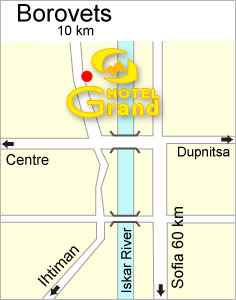 Hotel Grand offers various seasonal - summer and winter holidays in a pleasant atmosphere and perfect prices. The hotel offers comfortable single and double rooms, suites, penthouses. Hotel Grand accept tour groups, sports clubs of preferential terms.